Disney has launched a creative new contest in a search for a photo of John Lasseter from 1977. It isn’t just any photo they are searching for. You see, during 1977 and 1978, the Pixar and Disney Animation Chief Creative Officer served as a tour guide on the famed Jungle Cruise ride at Disneyland. Now, the search is on for a photo of Lasseter which one may or may not have tucked away in an old photo album. Find a photo (which can be verified) and you can win a trip to the grand opening of Cars Land at Disney California Adventure! Check out the contest video and the full press release here. From late 1977 through spring 1978, John Lasseter, before becoming chief creative officer at Walt Disney and Pixar Animation Studios and principal creative advisor for Walt Disney Imagineering, worked at Disneyland, and was a skipper on the Jungle Cruise attraction. Recently, a search for a photo of John skippering the Jungle Cruise came up empty. Surely there must be a photo of Skipper John somewhere? 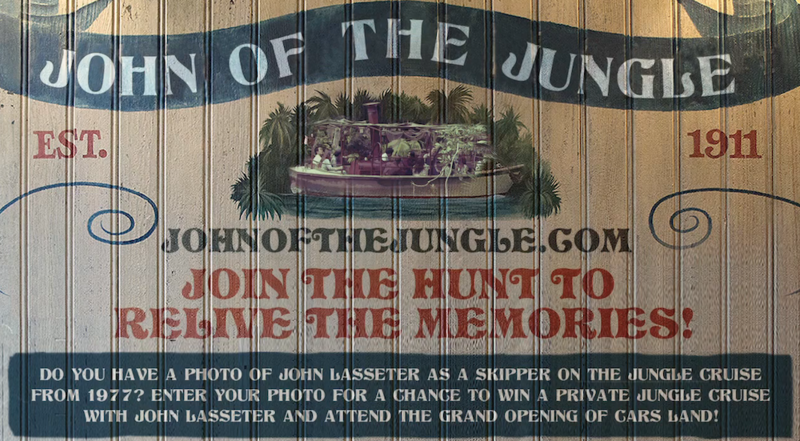 To find one, we have created a contest: the first person to submit a verifiable photo of John as the skipper of the Jungle Cruise from 1977 will win a trip for 4 to the grand opening of Cars Land at Disney California Adventure in summer 2012, and a ride on the Jungle Cruise skippered by none other than John himself! What better way to turn a Disney memory of old into a Disney memory of today?